Australian craft spirits distributor Nip of Courage is celebrating five years of business and a record breaking year in 2018. The business, which was founded by Kathleen Davies in 2013 is setting its sights on further growth and the expansion of its team in early 2019. Nip of Courage proudly represents 100 per cent Australian made and owned craft spirits, and since its inception has helped more than 2,000 wholesale customers around Australia to access Australian craft spirits from rural areas. These rural craft spirits producers include Belgrove Distillery (Kempton, Tasmania), Kangaroo Island Spirits (Kangaroo Island, South Australia), Reed & Co. Distillery (Bright, Victoria), Timboon Railway Shed Distillery (Timboon, Victoria) along with Stone Pine Distillery (Bathurst, NSW). Nip of Courage also represents The Aussie Tipple Company, a pre-batched cocktail business which launched in 2015. Davies is understandably delighted to have hit the five year milestone on such a high note and says that she is looking forward to the next five years. “Our hard work and commitment have led us to this point with 2018 proving to be a record breaking year for the team. “We’re extremely proud of the work we do and the difference it makes to the distillers that we represent, the local community and economy. We continue to go from strength to strength and are excited about our future growth as we plan for the expansion of our team early next year. Nip of Courage has identified more than 170 craft distilleries established in Australia and says that around 90 per cent of these are based in isolated areas. 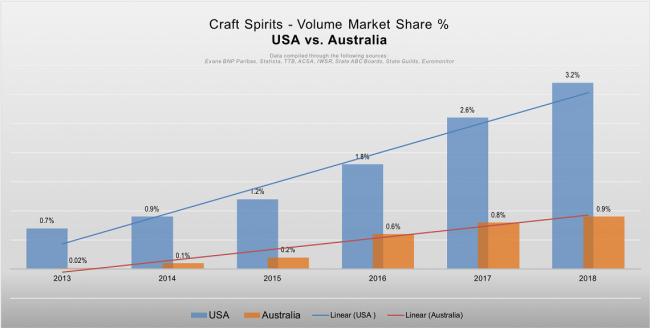 “In terms of volume it is estimated that the Australian market consumes less than one per cent of Australian made and owned spirits, in line with the US craft spirits market four years ago. The market share in Australia is attributed to the premiumisation trend globally particularly seen within the gin and whisky category. On top of this, Australian distilleries are beholden to a much higher excise tax regime when compared to their beer or winemaking counterparts. Speaking at the Australian Distillers Association annual conference, CEO of Spirits & Cocktails Australia Alec Wagstaff dubbed it a “spirits super tax” and said that Australian spirits consumers and producers “deserve a fair go”.